Turn DBX to HTML Web files online in a few clicks! Use a DBX to HTML Online Converter here or buy our Great batch App! 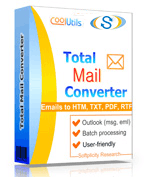 Get Total Mail Converter to convert your emails safely. Convert emails from multiple sources to a variety of formats. Filter emails that you want to process with our 2-level filtering. Useful data saving options - convert only necessary data from your emails. Unique output files formatting options specify how your files will look. Affordable Price - pay once for a lifetime license with no hidden fees. Command Line Support - convert emails via command line. Fast batch conversion - convert multiple emails simultaneously. High security options - protect your output PDF files. Various file naming and date saving options - organize your output files easily. Variety of attachment saving options - choose how to save attachments. Trust - you can rely on powerful email converters from CoolUtils. Easy to use even for beginners - enjoy clear user-friendly interface. Description Microsoft Outlook Express-based DBX files harbor folders with letters. In turn, the letters are packed in mailboxes. Since files are assigned to specific folders, they are named and suffixed respectively, so files assigned to Inbox are named inbox.dbx; similarly, files assigned to the Draft mailbox are suffixed drafts.dbx. Because DBXs can be copied, you can back up all your letters. Microsoft Outlook Express is the simplest and therefore most preferred program in terms of editing or importing a DBX. Manual modification may lead to corruption and mess up the work of the client.